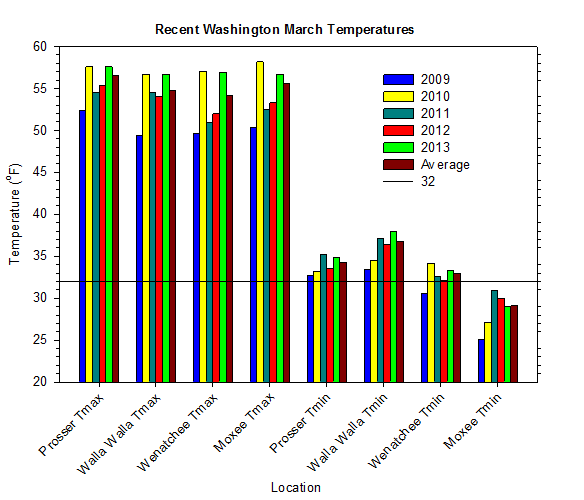 Washington's weather was like a roller coaster ride during March, as the state see-sawed between temperature extremes. Conditions were generally somewhat warmer than normal, especially during the day, although there were significant week to week temperature swings. Relatively mild weather on the 1st quickly yielded to cooler and more seasonal early March weather. Further cooling arrived on March 5th, courtesy of a cold upper low pressure area that sent highs dropping into the 40s in many areas. However, major changes began on the 10th, as the state experienced unusually warm weather from the 12th through the middle of the month. Highs were around 70°F in the warmer areas, while lows were generally in the 40s. A cold front crossed Washington on March 16th, giving rain to western areas and wind to eastern Washington. As much cooler temperatures returned, lows dropped to as cold as 20°F at Pomona on March 18th. The most exciting weather event of the month was the strong storm that slammed into the region on March 20th. The potent weather system packed quite a punch as it delivered a diversity of weather extremes to the area. Temperatures warmed slightly in advance of the storm, as significant rain fell in southwest Washington, with over an inch recorded in the region. By the afternoon of the 20th, a cold frontal passage brought strong winds to much of eastern Washington. Winds gusted up to 65 mph at Huntsville, while sustained winds peaked at 47 mph. The dynamic storm also caused rapid temperature changes due to strong air mass contrasts and rapid wind direction changes. The temperature spiked to 70°F at College Place around noon on the 20th, before dropping 20 degrees in just 30 minutes. Other unusual day-time temperature patterns were observed all across the state. Heavy snow fell in the mountains in the wake of the system, with totals of 2 feet at places like Mt Rainier. Even western Washington received some snowfall, thanks to a Puget Sound Convergence Zone that dropped several inches in the Everett area on March 22nd. The cold air mass that followed the storm led to 4 consecutive mornings with temperatures in the teens at places like Moxee, while highs struggled into the 40s and 50s. Beginning on the 26th and 27th, milder conditions returned to Washington, as highs climbed into the 50s and low 60s, and lows moderated to well above freezing in most areas. Despite periodic clouds and occasional showers on the 27th and 28th, most areas remained dry. For the final few days of March, sunny and dry weather dominated the state. 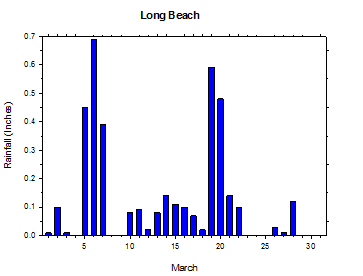 On March 30th, Vancouver soared to 78 degrees, while Long Beach also rose into the 70s. By Easter Sunday, March 31st, temperatures rose into the 70s across much of Washington for the first time since October, including a toasty 76 degrees around the Tri-Cities area! The temperature changes were so drastic that many areas that reached the 70s at month's end had been in the teens just a few days earlier. Overall, it was a variable and somewhat active month, although conditions were still generally drier than normal. March began with mild temperatures, as rain from an atmospheric river brushed northwestern Washington while lifting northward and out of the area. Wenatchee reached a high of 67°F on March 1st. Due to moisture and clouds, low temperatures around the state were only in the 40s and low 50s. Mt. 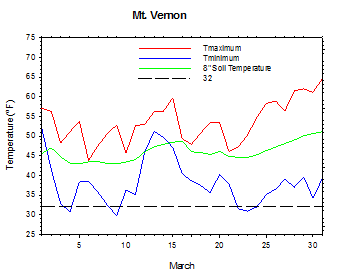 Vernon's low temperature was 52°F, while the Tri-Cities dropped to only 46°F. A cold front crossed the region on March 2nd, as rain came to western Washington and wind moved into eastern Washington. Temperatures were more seasonal on March 3rd and 4th, as high pressure built into the Northwest. The morning of the 4th was clear and cold, with lows generally below freezing statewide. Moxee fell to 18.7°F, while the lows at Sequim and Long Beach were 24°F and 28°F, respectively. A cold upper low brought unsettled weather from the 5th to 7th, before drier and milder weather returned. A chilly rain and mixed precipitation fell in south central Washington on the morning of March 6th, while Ellensburg received a couple of inches of snow. The clouds and precipitation caused very chilly high temperatures in central Washington on the 5th and 6th. 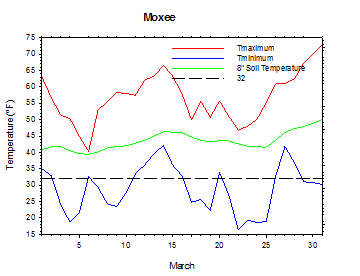 Moxee reached only 40°F on March 6th. Warmer highs and sunshine returned to central Washington by March 7th and 8th, although clear and chilly nights reappeared as well. Sunny and pleasant weather on March 9th yielded to increasing clouds on March 10th, as rain developed on March 12th in parts of western Washington. However, very mild air moved into Washington at the same time, bringing the warmest temperatures (to that point) of 2013. Highs reached 71°F at Alderdale on March 13th, while lows were in the low 50s in areas like Mt. Vernon, thanks to a warm southwesterly air flow and a subtropical air mass. The heavy rain generally remained in coastal or mountainous parts of northwestern Washington, although most areas were periodically cloudy. March 14th was another day featuring high temperatures around 70°F in the warmest spots. Cooling began in earnest on March 16th in western areas and on March 17th east of the Cascades. A shot of rain came to western Washington on March 16th and showers persisted into the morning of the 17th, while central Washington was sunny but windy. Temperatures fell to below average levels, as snow returned to the mountains. 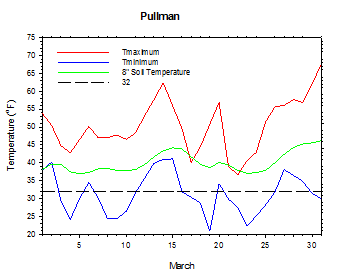 Highs on March 17th were as low as 40°F around Pullman, while lows were in the 20s in many areas. Strong southwesterly winds were common in eastern Washington, with daily average wind speeds of 20+ mph around Pullman and St. John. Widespread frost occurred on the morning of March 18th, with lows as cold as 20°F at Pomona. March 19th began with another cold morning featuring lows as chilly as 18°F at LaCrosse. A moist weather system arrived late on March 19th, giving Washington its most interesting weather of the month. Due to increasing clouds and calm conditions, highs were as cold as 43°F in areas like Underwood and Wenatchee Heights. The powerful storm brought with it significant rain and warming temperatures on March 19th and early on the 20th, and then windy and much cooler conditions, with heavy mountain snow behind the cold front. 1.1 inches of rain fell at Montesano on March 20th, and more than an inch and a half was recorded during the storm. 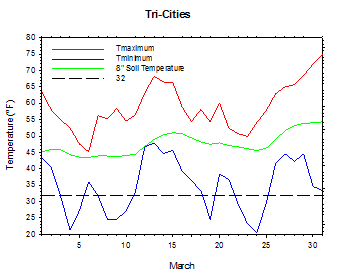 With the strong frontal passage during the early afternoon of March 20th, strange temperature trends were observed. Temperatures at College Place spiked to nearly 70°F around mid day due to southerly downslope flow, before falling 20 degrees in a 30 minute period. 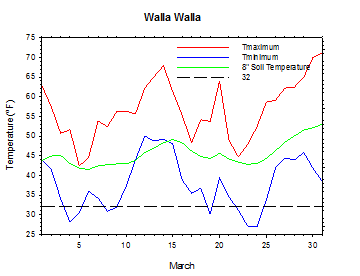 Despite temperatures in the upper 60s early in the day, the Walla Walla area spent the remainder of the afternoon in the upper 40s with a strong west wind. Meanwhile, the opposite trend was observed in places like Yakima. Cloudy and cool conditions early in the day changed quickly, as temperatures jumped into the upper 50s around 1 pm due to increasing winds and clearing skies. Winds gusted as high as 65 mph at Huntsville, with sustained winds at 47 mph. Basin City experienced a station record wind gust of 40 mph. By the morning of March 21st, there were snow showers even in the lowlands of western Washington, and 14 inches of snow had already fallen at Crystal Mountain. Several inches of snow accumulated around the Everett area on the morning of the 22nd, thanks to a cold northwest flow creating a Puget Sound Convergence Zone, which is the region where air flowing around the Olympic Mountains collides and rises. Highs on March 21st were as cold as the upper 30s around Pullman, while lows in the 20s were commonplace. Snow continued to fall in the mountains through the morning of March 22nd, with totals of around 2 feet in the high country. 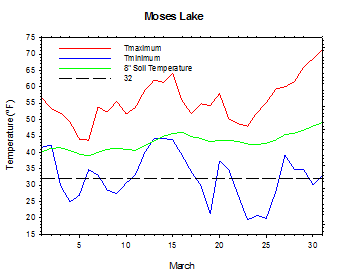 Temperatures dropped to 16°F at Moxee on the morning of March 22nd. In the wake of the potent system, conditions gradually calmed down, though the cold weather persisted. On the 23rd and 24th, highs were in the 40s and 50s, while lows were as cold as the teens. On March 24th, the low temperature was 18°F at Benton City, and 17°F at Broadview (Ellensburg). Low temperatures slowly moderated with time, but still dropped as low as 25°F at Sequim and 17°F at Broadview on March 25th. On the morning of March 26th, temperatures were as cold as 25°F at Brewster Flat, although the sub-freezing air was confined to the northern half of central/eastern Washington. Much warmer weather returned for the final few days of March. High temperatures on the 25th reached the low 60s in parts of western Washington due to offshore flow, with a high of 63°F recorded in the Seattle area. 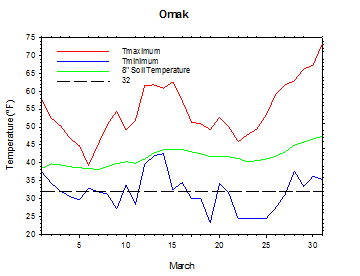 Although a few locations around Omak dropped below freezing on the morning of March 27th, most areas were safely above freezing. Scattered clouds and a few showers on the 27th and 28th gave way to sunny, dry, and very warm weather for the end of March. Lows were generally in the 30s and 40s, with highs warming from the 60s on March 28th to the 70s on March 31st. Under sunny skies and a dry air mass, high temperatures were as warm as 78°F at Vancouver on March 30th, and 76°F at Montesano and in the Tri-Cities on the 31st. 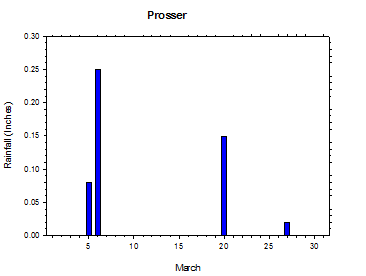 The average March temperature at Prosser (WSU IAREC) was 45.8°F, which is 0.4 degrees above average. The average high temperature was 57.6°F, which is 1.1 degrees above average. The average low temperature was 34.8°F, which is 0.5 degrees above average. The maximum temperature recorded last month was 72.8°F on March 31st, while the coolest daily high was 43.1°F on March 6th. Low temperatures ranged from 45.9°F on March 27th to 23.9°F on March 4th. Daily average temperatures ranged from 55.4°F on the 14th to 36.3°F on the 23rd. The monthly precipitation total was 0.50 inches. 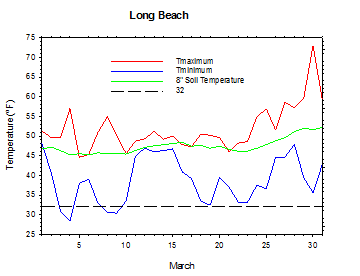 The average wind speed was 5.3 mph, and the average 8 inch soil temperature was 45.6°F. 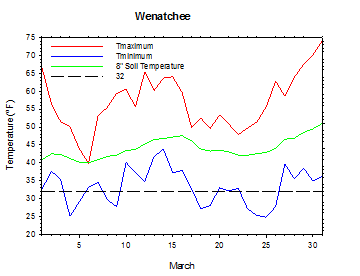 Wenatchee (WSU TFREC) recorded an average temperature of 44.5°F, which is 1.2 degrees above average. March 1st: The low temperature at Mt. Vernon was a mild 52 degrees. March 6th: The high temperature at Moxee was only 40 degrees. March 13th: The low temperature at Mt. Vernon was 51 degrees. March 20th: The wind gusted to 65 mph at Huntsville, with a 15 minute sustained wind of 47 mph. March 24th: The low temperature at Benton City dropped to 18 degrees. March 31st: The temperature at Montesano soared to 76 degrees. Just as the growing season began in south central Washington, cold temperatures necessitated the use of frost protection on several nights during mid to late March. As a result, there were reports of frost damage on some cherries. Moxee fell into the teens on four consecutive nights from the 22nd to the 25th. Otherwise, preparation for the growing season continued across Washington during March. Potato and spring wheat planting, as well as fertilizer application, began in Adams County late in the month. In central Washington, Chelan County growers finished with pruning and clearing fields as preparation for spraying began. At the end of March, bud break was reported on berries in Whatcom County as pesticide applications commenced. Overall, Washington crops were faring well, although winter wheat in Lincoln County was adversely affected with snow mold (National Agricultural Statistics Service). 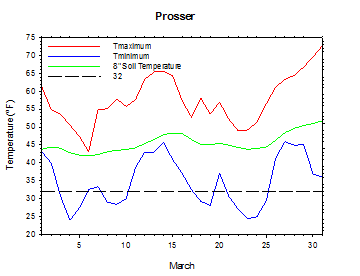 On March 31, 2011, the temperature at Prosser (WSU IAREC) soared to 79 degrees. Despite the temporary warmth, most of the spring of 2011 featured well below average temperatures. According to the Climate Prediction Center (CPC), near normal temperatures and precipitation are expected during April, with slightly enhanced odds of cool conditions later in the spring, and then above normal temperatures and below normal rainfall are forecast for the summer and early autumn. ENSO Neutral conditions are most likely to continue into the autumn, although the outlook for this winter is uncertain.